I’ve had so many questions about my ring since we got engaged and I’m finally doing a ring post. I love my ring, and it is something that makes me very happy to talk about. We were really lucky to find exactly what we were looking for. I knew when we started talking about getting married that the ring would have to be something that felt true to my style and was very unique. Finding the perfect one was a bit of a journey. When Jeff asked me what kind of ring I would want, I was overwhelmed by choices, but I had a vague notion of what I wanted in the back of my mind. Many years ago, my mom got a stack of paper-thin rings that were shaped irregularly and adorned with abstract rosettes and tiny rough cut diamonds. They were by Lebanese designer Rosa Maria. I always loved and coveted her rings, they had a design sensibility that really spoke to me. I started doing my research on Rosa Maria to see if any of her rings could work as an engagement ring. Unfortunately for me, the store my mom had bought her rings from (4510’s old store on McKinney) had long since stopped carrying her jewelry. Not many stores in the US do, actually. Her rings are handmade in Beirut. I looked at a variety of ring styles that Rosa Maria did online. Many of her rings are absolutely massive in person. Some are almost the size of my palm! Very few of them look anything like traditional engagement rings. It was important to know exactly the scale of ring that I was getting. I exchanged emails with some stores stateside that do carry Rosa Maria (including Joan Shepp in Philadelphia) and while the rings were amazing, they didn’t feel very bridal. The “one” ring that felt perfect for an engagement ring eluded me. 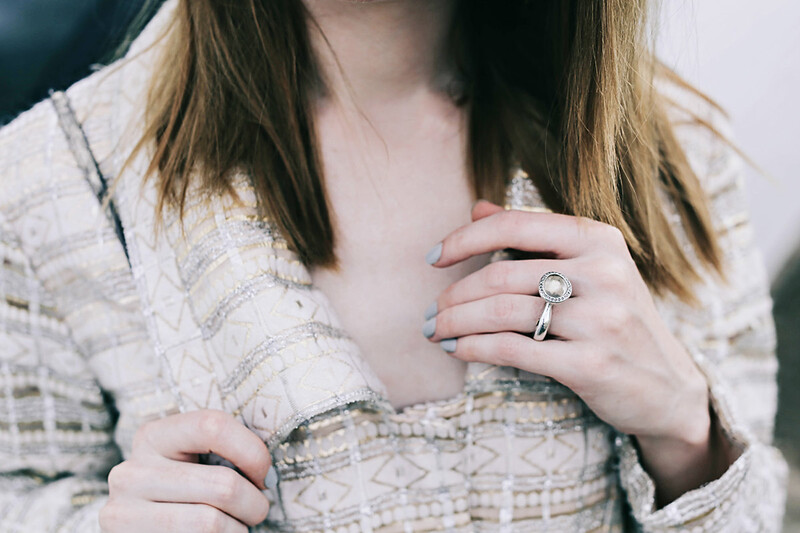 We did go to a few jewelry stores and I tried on a lot of really beautiful rings, some vintage and some more modern by some really cool designers. None of the rings we looked at really did anything for me. I was pretty determined that my ring was going to be Rosa Maria at this point. I loved the sculpturalism and rough polish of her rings. I continued my hunt. One day last October sitting in the airport with Jeff, I was browsing her rings on my phone when I decided to try theRealReal to see what would come up. There were maybe two pieces of Rosa Maria. One of them was absolutely, unmistakably, beyond a shadow of a doubt, exactly the ring that I wanted. The one that had been eluding me for months! I wasted no time showing Jeff the ring. We both knew we wanted to get engaged sooner rather than later and I had a pretty good idea when he was going to ask me (sometime in December). It was a double win for us because buying my ring on consignment was really cheap compared to full price. My engagement ring cost $800 dollars. That made me really happy, because we both feel that a symbol of eternal love shouldn’t come with a huge price tag. I prefer buying almost everything second hand, so it felt fitting that I got my engagement ring on consignment. I figured Jeff bought the ring before we even took off for our flight, because by the time we landed and were at the hotel the ring was shown as sold. Needless to say, I was totally freaking out and excited! I was correct in suspecting that Jeff was going to propose in December. On December 12th as I got ready for our anniversary dinner, I was very happy but also kind of anxious. December held a number of great opportunities for Jeff to propose. The anniversary of our first date is December 12th, Jeff’s birthday is on the 17th, my birthday is on the 23rd, then there is Christmas, Christmas Eve, and New Years Eve. Any of those days would have been excellent choices for a proposal, so I was on pins and needles wondering which it could be. As we headed towards the door to leave for dinner, Jeff stopped me and told me he had something for me. It was the only time I have seen Jeff get nervous! It was so funny, looking back on it now. My heart jumped into my throat when he pulled out the(!!!) box. I said yes and cried a little bit. I called my family, then Jeff and I celebrated with champagne at our favorite Italian restaurant. It was a magical night! The ring was more perfect in person than I could have ever imagined. It makes me ridiculously happy every time I look at it. You’ll notice the band is quite thick…I had to take it to a specialist jeweler to get resized. If you notice me not wearing it all the time lately, it is because I need to get it resized again, it’s a little loose right now. I’m really excited to get my wedding bands, I think the ring will look even better with more of Rosa Maria’s stunning bands surrounding it. I hope this post helps those who were curious about it! That ring is stunning! And you two are precious together! http://trendkeeper.me – Booties to buy NOW! Darling , I feel as though I know you . I know that sounds funny but I regularly read your blog and you regularly share more about your life . I had thought about what type of engagement ring you would wear . Voila there it is , beautiful, it has a vintage feel without feeling old fashioned. It is perfectly beautiful and suits you….wishing you two much love and luck. Fabulous story of the ring. I too have been trying to get a good look at your ring because I could see it was something unique. My original wedding band was a LAGOs for the very reason that it was unique. Thanks for sharing! Very unique . May I ask what stone is that? 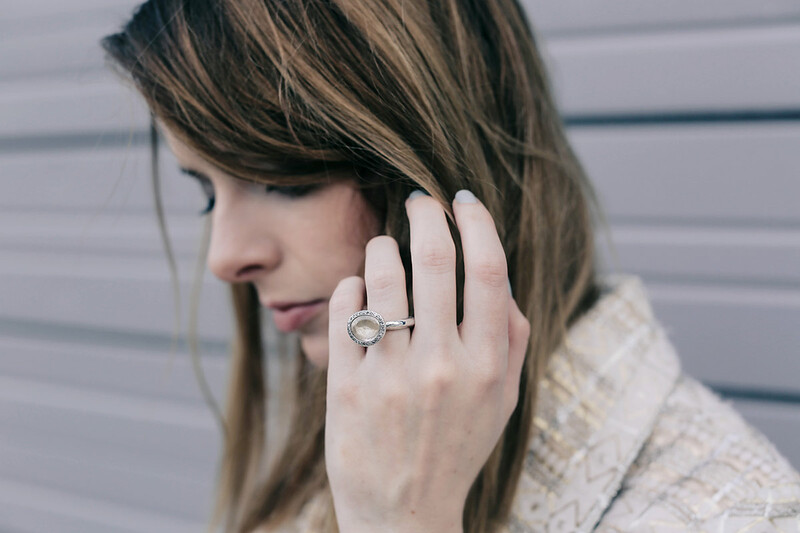 It’s a very BEAUTIFUL ring with a kindred spirit and connection to the wearer. I believe you chose one another for this ring would NEVER look more beautiful than adoring tour hand.. Peace, blessings, love and much prosperity to you and your future hubby! Your ring is absolutely exquisite, I to like things that are different but yet expresses who I am. Wishing you both a lifetime of happiness. what a beautiful story! the ring was made for you! Stunning Ring… Feel happy to see you together. Looking for vintage tone but also it matches with today’s trend. Wishing you a Happy Life…! I am so happy for you, I have been following for a very long time, this was one of the very first fashion blogs I discovered. Loved reading the story! The right ring is always there out waiting for us, somtimes is simply a little bit harder to find it but voila! You found it!! I love how you even gave the price! Many brides want to outshine everyone else, yet you picked what was right for you. What a great read and thank you! I’ve been quietly following you since your first shoe collab with Urban Outfitters (so a million years) and I truly feel like you’ve affected my style more than anyone else in my life! I have to say this post made me tear up. I’m so thrilled for you and Jeff and I know you’ll both get the years and years of happiness you deserve for giving your audience so much happiness. Darling pls share us the color and brand of your nailpolish which is so matchy with your beaut ring! So happy for you! I have been following your blog since you were featured in Teen Vogue so many years ago. Also, I recently got engaged too! The ring suits you very well and I totally understand the feeling of getting so happy just looking at a ring. I love all wedding/engagement/Jeff+Jane posts. Can’t wait for more!!!! It’s perfect! I want one, can you please tell my husband?